December 1992 will be remembered for the historic separation of Prince Charles and Princess Diana. John Major was Prime Minister, Whitney Houston’s power ballad “I will always love you” was set to be the Christmas number one and Norwich City were top of the first ever Premier League. December 1992 was also the month that Tuffa UK moved into their Dovefields Industrial Estate home in the Staffordshire market town of Uttoxeter. 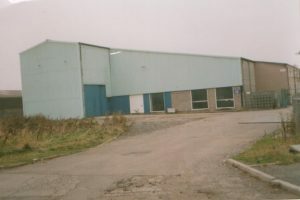 The unit was described as “a substantial industrial premises” in the estate agent’s details and the move was prompted as Tuffa out grew its original premises in the nearby village of Marchington. Back then the company employed just 6 staff, and the larger premises enabled them to invest in an on-site rotational moulding production facility, an integral part of the manufacture of plastic tanks, rather than having to outsource the operation. A quarter of a century later, the site is unrecognisable. Tuffa has made improvements to the front of the site and extended the factory. This now houses the plastic moulds, ovens and workshop, a steel fabrication and welding plant and a new mezzanine production facility for the manufacture of the diesel additive AdBlue tanks. …and Tuffa Tanks as it looks today. The firm’s owners, husband and wife Robert and Jackie Shenton are the only remaining members of the original team. Both still work in the business today. Robert is officially “retired” but just can’t stay away from the place! He is still in every day offering his support and vast technical knowledge to customers. A second generation has now joined the family firm. Eldest son, James Shenton, is now General Manager while his younger brother Daniel is part of the Production Management team in the factory. Robert’s nephew, Jason, is Production Manager, and his wife Kerry is Office and HR Manager, completing the Shenton family line-up. 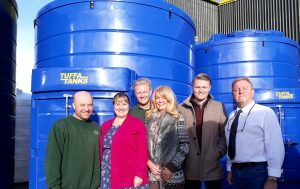 Tuffa Tanks now employs over 30 people running up to three 8 hour shifts each day producing over 2,000 tanks a year. A Family Affair. Two generations of the Shenton family celebrated 25 years of Tuffa UK in Uttoxeter. In addition to the production of the AdBlue tanks, latest innovations include a unique patented fire protected tank. This is a bunded tank in a range of sizes from 1,350 to 15,000 litre capacity in plastic and from 900 up to a huge 200,000 litres in steel. Fire protection is provided by a specially developed material with the tanks offering a choice of either 30 or 60 minutes of fire protection. As well as improving safety for users and property, the fire protected tanks can be located closer to property. This enables users a to have smaller footprint and more efficient use of space.